www.888poker.com ; www.williamhillpoker.com and www.fulltiltpoker.com . 2. Omaha — has all the rules of Texas Holdem except for one variation: you get four instead of two hole cards. Omaha poker action is more intense because of all the possible combinations you can achieve with your four hole cards. You can actually just use two hole cards, but you can maximize your winning with all four cards (think easier full houses and flushes). Popular sites that offer Omaha: www.pokerstars.com ; www.lotospoker.com and www.pokermira.com . www.titanpoker.com ; www.bwin.com and www.partypoker.com . 6. Crazy Pineapple — think of Crazy Pineapple as Texas Holdem’s crazy half-brother. Crazy Pineapple poker plays out similarly to Texas Holdem except that you get three hole cards instead of two. So it’s in between Holdem and Omaha, but just as fun as the other two variations. Sites that have Crazy Pineapple games: www.bwin.com and www.redkingspoker.com . www.titanpoker.com ; www.pokerstars.com and www.williamhillpoker.com . www.pokerstars.com ; www.fulltiltpoker.com and www.888poker.com. 9. HORSE Poker — the letters are actually an acronym for (H)Holdem; (O)Omaha; (R)Razz; (S)Seven Card Stud and (E) Seven Card Stud Hi-lo Split Eight. HORSE Poker plays out all these variations in rounds. So you start with Holdem in the first round, then Omaha in the second, and so on. HORSE requires players to constantly change strategies to fit the variation per round. Here are sites that have HORSE Poker: www.pokerstars.com and www.888poker.com. 10. Strip Poker — might not need a lot of explanation. We’re sure you understand the rules for Strip Poker quite well. Maybe you’ve played Strip Poker at one point in your life (though you’re just afraid or embarrassed to admit it). The objective of the game is to come up with the best hand and win the other player’s chips. Once they run out of chips they can buy more by trading a piece of clothing. A player loses when they put on their birthday suit. 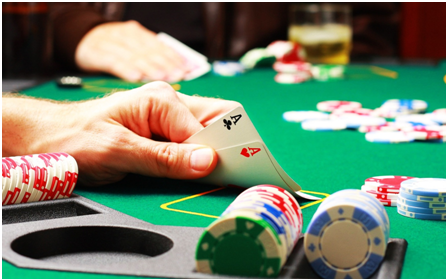 There you have it: 10 different poker games you can play online. With this long list of poker variations, the poker enthusiast in you will have one hell of a time learning and playing these games. Enjoy the game and we hope that you get to keep your money (and your clothes).